Contributed by Geoff Klassen (geoffk1@shaw.ca), who writes: "A few years back, my older brother taught me a card game called Snitch. At least that's what he was told its name was. I'm not sure where he got it from, but I was wondering if you knew of any other names for the game or any similar games." Editor's Note. This game is reminiscent of the Iranian game known as Gharat (Loot). It's not quite the same though - in Gharat you are dealt four cards and do not draw any more until they are all played. There are no wild cards, and the scores are slightly different. If anyone can shed more light on the origin of Snitch and its relationship to Gharat, please let me know - John McLeod. Object: To gain points by creating sets and stealing other players' sets. Discard a card to the discard pile and pick up a card from the stock pile. Create a set by combining one card from his hand with the top card on the discard pile. Challenge an opponent's topmost set with a similar card or wild (e.g. challenge a 4-4 with another 4, a 2, or a Joker) by placing his challenge card down somewhere (in the vicinity of the challenged player) and declaring the challenge. 'Defend' the set by also placing a similar card or wild down somewhere and declaring the defence. Give up the set, regardless of whether he can defend them. A challenge need not end after a single phase of challenge-defend. If he so wishes, the challenger may continue the challenge by placing another similar card or wild down and restating the challenge, after which the defendant may defend in a likewise manner. Obviously, this process can only occur up to three times, since the players begin the turn with only three cards each. Whoever wins the challenge adds the played cards to the challenged set and, if necessary, makes the set his by placing it on the top of his 'stack'. After a player has made his turn, if he holds fewer than three cards, he draws until he has three, after which the defendant (if there is one) replenishes his hand the same way. Example: It is Player 1's turn. He has a hand of 7-K-2 and a set of Aces in front of him. Player 2 has a set of 7s, on top of which she has a set of Kings. The top card on the discard pile is a 9. He may choose to discard & draw, combine the top 9 with his 9 to make a set & place it on top of his aces, place a 9-2 (or K-2) set on top of his aces, or challenge Player 2's Kings with his King or his 2. He may not challenge Player 2's 7s with his 2, because the 7s are covered by the Ks. 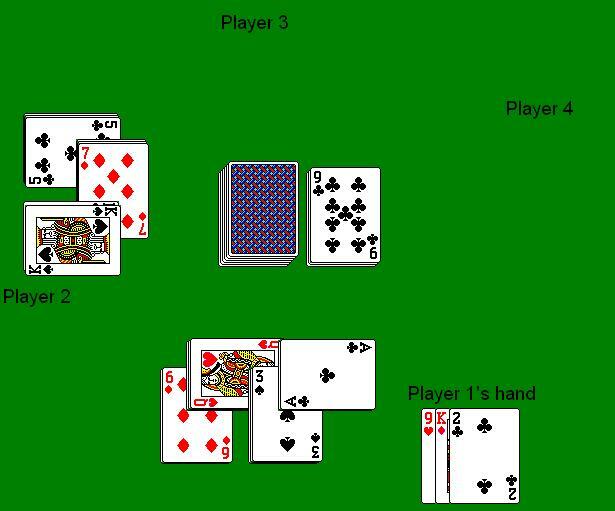 Create sets using only cards from their hand. Once all players have no cards remaining in their hands, play is over, and counting can begin. Each player gathers the cards in his sets and counts his points. The deal now shifts to the left; extensive shuffling is encouraged. The first player to reach 1000 points.